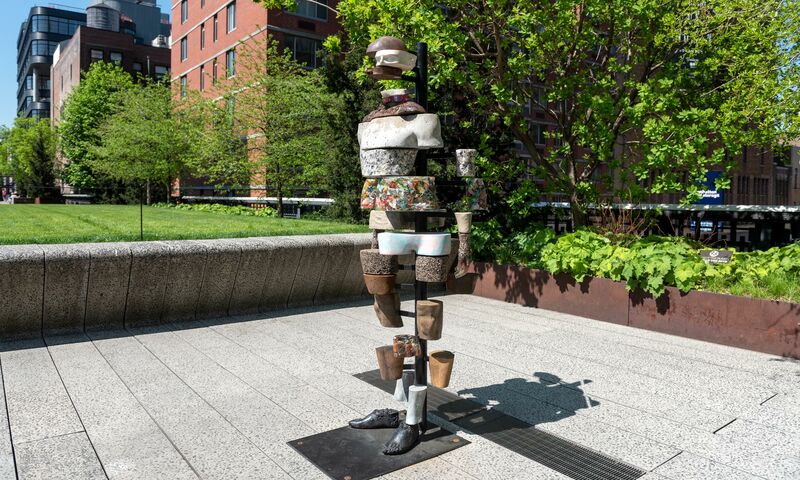 Maria Thereza Alves, A Ballast Flora Garden: High Line, 2018. 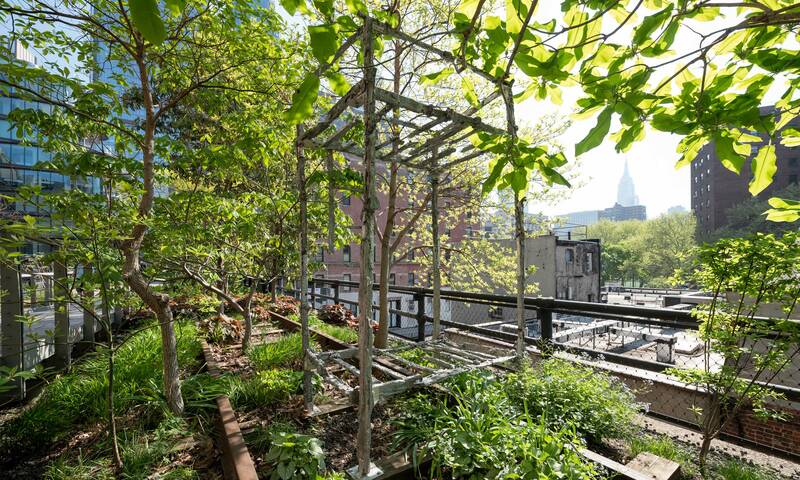 Part of Maria Thereza Alves, Seeds of Change: New York —A Botany of Colonization, co-commissioned by the Vera List Center of Art and Politics at The New School, Pioneer Works, Weeksville Heritage Center, and High Line Art. Image: Duane Linklater, pêyakotênaw, 2018. Maria Thereza Alves (b. 1961, São Paulo, Brazil) addresses the relationship between imperialism, conquest, and the erasure/silencing of indigenous people. A Ballast Flora Garden: High Line is one of three gardens that are part of Maria Thereza Alves’s Seeds of Change: New York—A Botany of Colonization, which unearths historical ballast sites and ballast flora that has traveled to New York City by trade ship ballast over the past two centuries. Earth, stones, sand, wood, bricks, and whatever else was economically expedient was used as ballast to stabilize merchant ships in relationship to the weight of their cargo. Upon arrival in port, the ballast was unloaded, carrying with it seeds native to the area where the ballast had been picked up. Over the past two centuries, more than 400 species of plants were brought over by ships and were growing on ballast grounds throughout New York, from where they have spread further since. 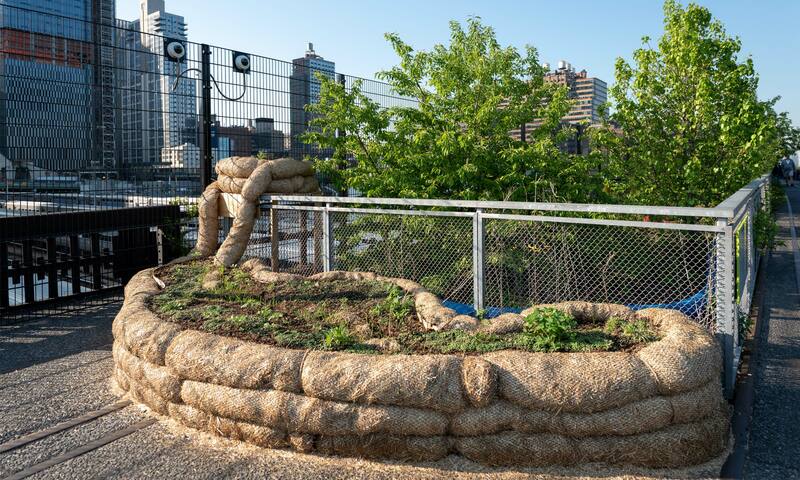 To understand this history, Alves has worked with horticultural experts and local communities at Pioneer Works, the High Line, The New School, and Weeksville Heritage Center to research the ballast flora and the stories it tells about migration, commodification, and valuation. It is an ongoing investigation in numerous port cities realized previously in: Marseille, France; Reposaari, Finland; Liverpool, UK; Exeter and Topsham, UK; Dunkirk, France; and Bristol, UK. Andrea Bowers (b. 1965, Wilmington, Ohio) is a Los Angeles-based artist working in video, drawing, and installation. Her work foregrounds the struggle for gender, racial, environmental, labor, and immigration justice, and the experiences of those who are directly affected by systemic inequality. 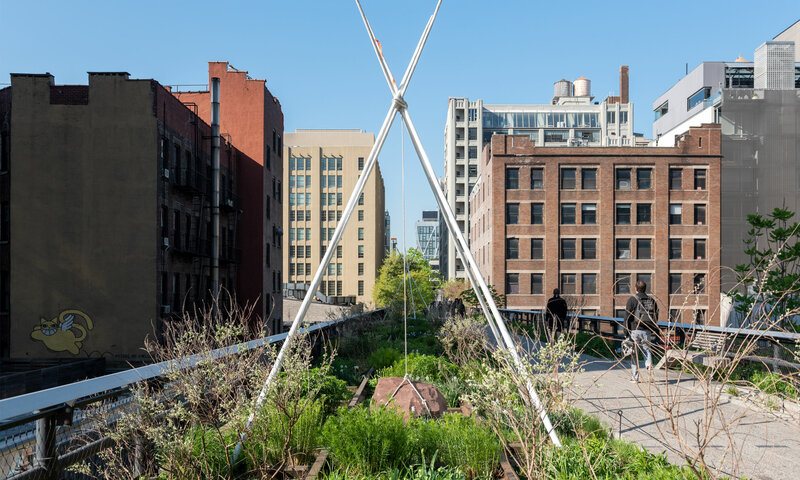 For the High Line, Bowers collaborated with the immigrant rights organization Movimiento Cosecha to identify a key message from their work supporting undocumented immigrants. 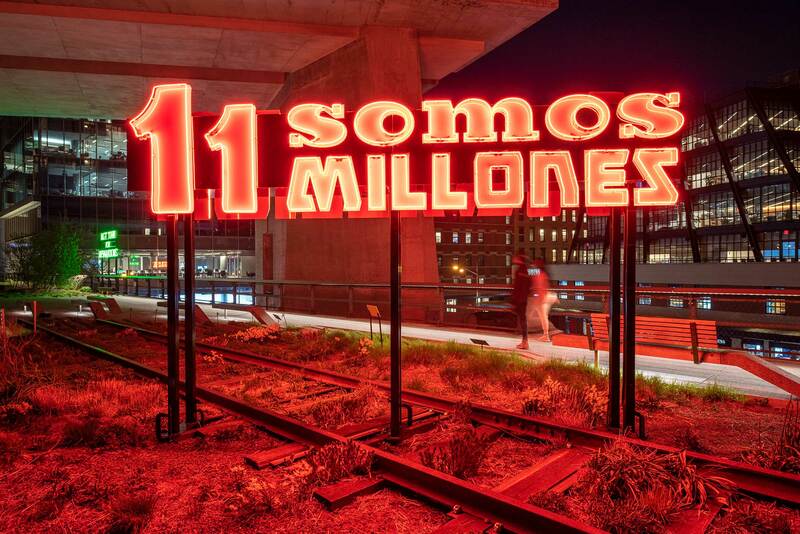 The result, a large neon sign reading “Somos 11 Millones / We Are 11 Million” is a reference to the estimated number of undocumented immigrants living in the U.S. today, and a tribute to their many unsung contributions to this country. Pope.L (b. 1955 Newark, New Jersey) is an artist working in performance, theater, installation, video, and painting. His works include physically demanding actions, as well as sculptures and performances that explore language, gender, race, ideology, and community. 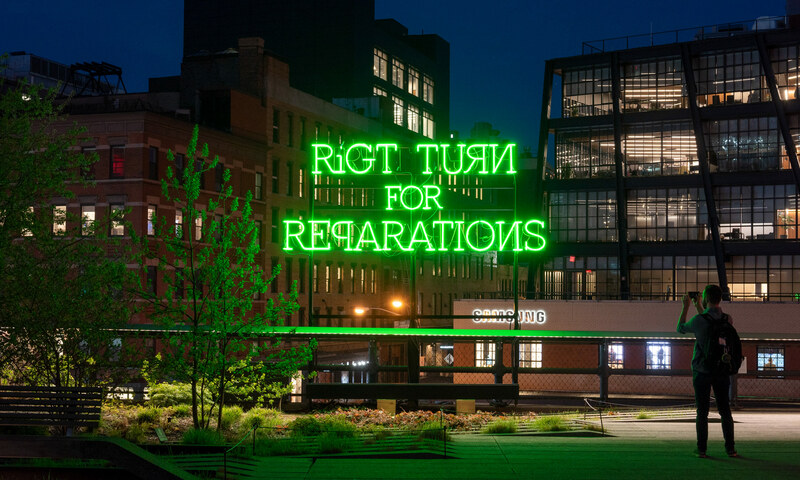 For the High Line, Pope.L presents a large neon sign that reads “RiGT TURN for REPARATIONS” in flickering red and green letters. The apparent typo and backwards letters are intended to make viewers read life differently. The red and green in his apparatus suggest the jolting stop-and-go vicissitudes of progress, love, and money, either apparent or impossible. Naufus Ramirez-Figueroa (b. 1978, Guatemala City, Guatemala) creates sculptures, videos, and performances that explore absence, presence, and the way our bodies interact with the built environment. For the High Line, Ramirez-Figueroa casts a bunk bed in aluminum, referencing the fraternity of a shared space, while also evoking a sense of loss. The fragility of the structure reflects the precariousness of childhood, and in particular, the experiences of the children in the illegal orphanages that appeared in Guatemala during the civil war from 1960–1996. Specifically, the work is influenced by the Buddhist belief that “form is emptiness; emptiness is form,” and that all things are interconnected. Marinella Senatore (b. 1977, Cava de’ Tirreni, Italy) is an artist working in performance and sculpture. In her work, Senatore is interested in creating a conversation between herself and the people experiencing it. 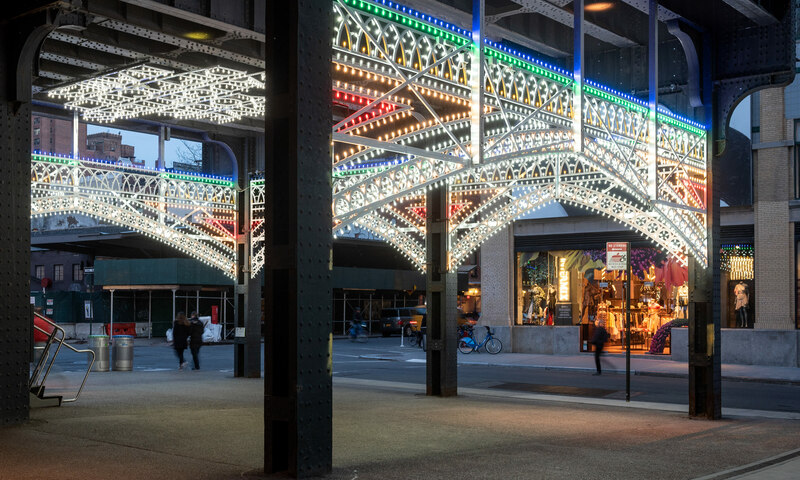 For the High Line, the artist presents an installation of festive lights under the park at Gansevoort Plaza similar to the celebratory ones made by artisans in Puglia, Italy, on the occasion of popular and religious events. The installation takes the title GIVE YOUR DAUGHTERS DIFFICULT NAMES from a quote by the feminist poet Warsan Shire, and creates a space of gathering and congregation—a public piazza for people to use. Sable Elyse Smith (b. 1986, Los Angeles, California) examines the complex language and emotional landscapes embedded in systems of surveillance and structures of constraint, and the often invisible ways in which they shape our minds and direct our bodies. 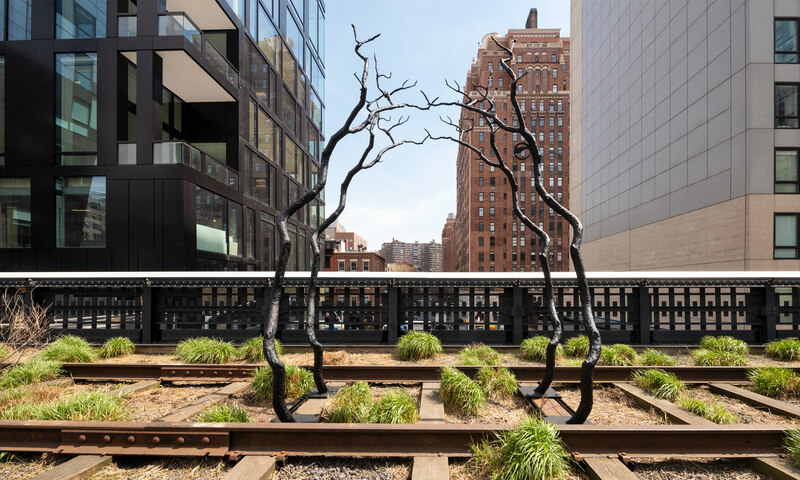 For the High Line, Smith creates C.R.E.A.M. 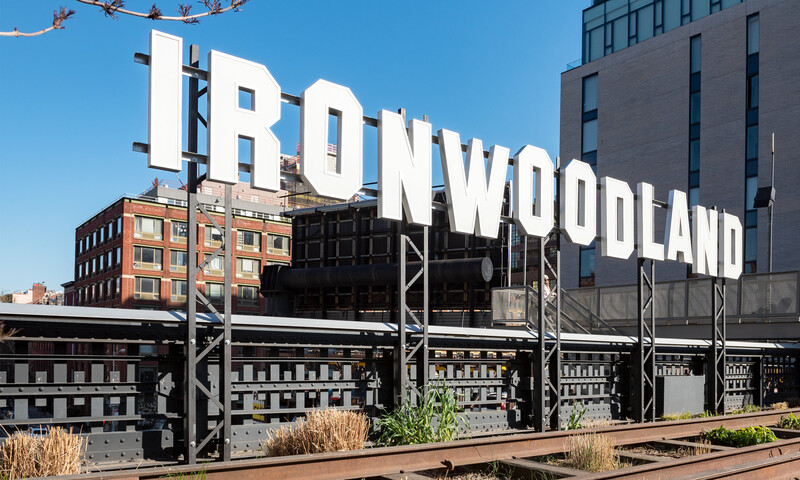 (titled after the Wu Tang Clan song), an altered replica of the Hollywood Sign that reads IRONWOODLAND—a reference both to the Ironwood State Prison and to “Hollywoodland,” the segregated real estate development that was advertised by the original sign. The piece draws attention to the contradictory nature of institutions that not only develop real estate, but prisons as well. Agora is supported, in part, by an award from the National Endowment for the Arts.